A unique stress testing + portfolio loss forecasting service that leverages a proprietary Dual-Time Dynamic technology. The process allows the user to look across vast industry data in order to gauge where they are in relation to the rest of their counterparts. 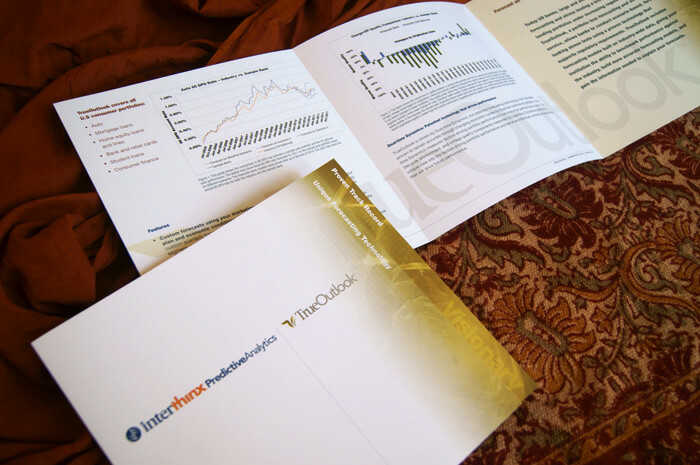 The TrueOutlook logo and brochure shown below are examples of what I can do to brand your company's product, service or corporate identity. Working with a tight deadline I created logo and overall visual. Through creative direction and management I created the 8 panel brochure shown below, tradeshow banners and related collateral.